This year I had my first opportunity to visit Mount St. Helens during the iconic bloom of Indian paintbrush and purple penstemon wildflowers that have flourished since its catastrophic eruption in 1980. I was especially interested in finding the location of photo composition that the area has become known for among landscape photographers. You’ve probably seen it dozens of times on Instagram or Facebook or Pinterest. It’s a wide-angle view, with the red and purple flowers close-up in the foreground, and the mountain in the distance. The conditions were perfect, and I was anxious to figure out where everyone was getting that epic image. I’m not immune to stretching the definition of staying on the trail to get a photo, but this is one of the most obviously out-of-bounds areas I’ve seen in my travels. It’s right up there with the boardwalk for the Grand Prismatic Spring in Yellowstone National Park, where three Canadian Instagram bros recently caused a minor international incident when they wandered out onto the bacterial pad, or Old Faithful. The only other person I’d heard of crossing the boundary is a tourist who wandered up to the famous fountain a couple of months ago, with an audience of hundreds of people, and relieved himself in the geyser. The wildflowers in front of the Johnston Ridge Observatory struck me as an incredibly sensitive and high-profile location that no nature-loving photographer would dare trespass. Having exhausted my quest to find THE spot, I moved on and found some nice scenes along the trail. It really is an amazing natural wonder, a living history of ecological collapse and rebirth. That’s the moment I realized that most of those Mount St. Helens photos I’d been admiring were taken by wall hoppers and wildflower crushers. One of them chimed in that they were being careful out there and it wasn’t a big deal. I wondered whether they’d be willing to venture out while the observatory was open, with hundreds of people watching, and a half-dozen park rangers on site. If it was not a big deal, why not do it then? At least the guy that peed in Old Faithful had the integrity to do it in the middle of the day. Recently, I was reminded of that unpleasant experience when the Washington Trails Association announced the winners of their annual photo contest. 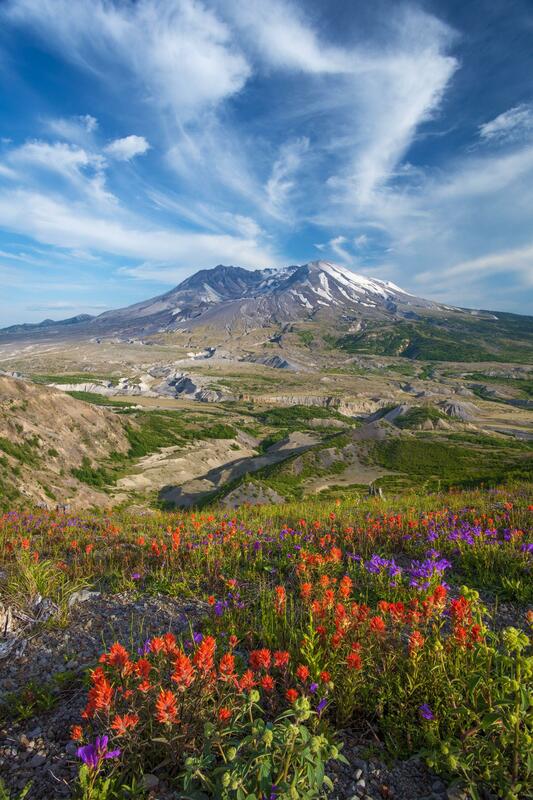 It’s become an annual tradition for me to enter photos and enjoy the unveiling of the winners, which this year includes THE shot of Mount St. Helens. The Indian paintbrush glows in the foreground, the mountain hovers in the distance, the afterglow of the sunset filters the scene with gauzy pastels, and I was almost certain it was taken out there in front of the observatory. I did a little investigating, comparing other photos with the award winner, and confirmed my suspicions. The good folks at Washington Trails didn’t know any better, but the photo contest celebrating our great state’s trails is highlighting a blatant example of disrespecting the trails. This is one of many sensitive locations that are endangered by nature lovers and photographers. The current feedback loop of social media often creates a frenzy around photo locations like this one, which leads to an ever-growing pilgrimage of people who want to get that one photo, especially when it’s an award winner. I’ll leave it to the park rangers to sort out how to police the rule breakers, but I do have an observation about exploring and photographing nature in the social media age. The worst thing I can do on a photo outing is to start with my creative instincts held captive by other people’s work. That was my big mistake that day at Mount St. Helens. It was only when I gave up trying to copy someone else’s composition that I was able to see what was in front of me, instead of what wasn’t. My best days as a photographer – and a person for that matter – are those days when I’m not preoccupied with what everybody else does. When I don’t have other people’s pictures in my head, it’s amazing what creative visions bubble up from the mysteries within me and around me. On those days, I often find the adventure of a trail less traveled, and the satisfaction of not having crushed the wildflowers along the way. Published: Feb. 10, 2019, 5:30 a.m.